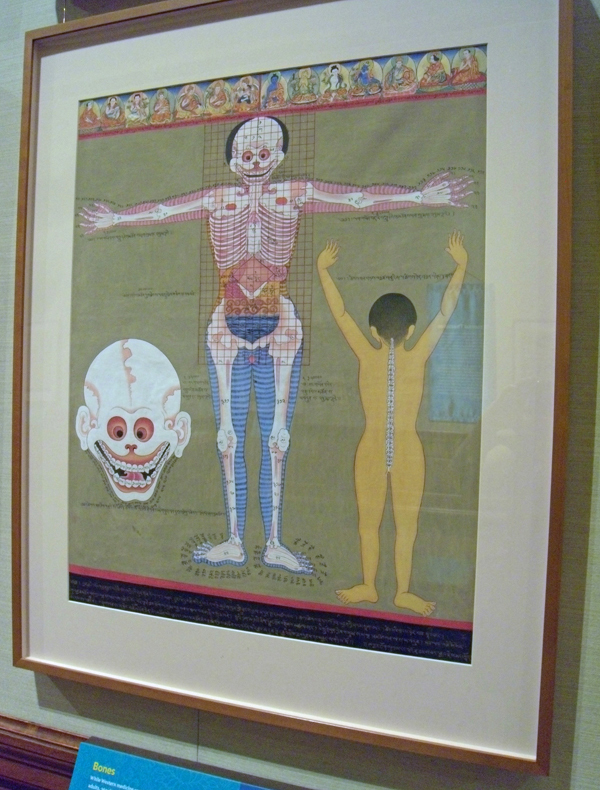 This is the last weekend for the exhibit of Tibetan Medical Paintings: Body and Spirit at the American Museum of Natural History in New York. We went a few weeks ago and it was definitely worth seeing, particularly if you are interested in this area of study. On display are 64 paintings from the Museum's collection. It's the first time that these paintings have been displayed together. They are hand-painted, reproductions of traditional scroll paintings which detail some of the history, early medical knowledge, and procedures used in Tibet and are believed to be among only a handful of such sets in existence. The images are extremely detailed and are painted in vegetable and mineral dyes. Each of the paintings on display was painstakingly reproduced by hand in the 1990s by Romio Shrestha, a Nepalese artist, and his students. The originals were created in the 1600s. The exhibit ends July 17th, 2011. I had taken photos of the exhibition, but ran across an informative tutorial on YouTube (posted below) which explains the Collection pretty thoroughly. Probably one of my favorite pieces, however, was the explanation in a group of paintings that catalogs various health problems and their origins according to the Tibetan Buddhist system. 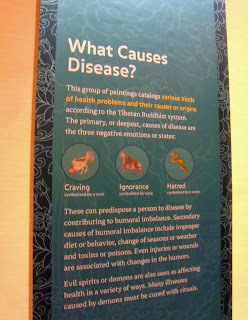 "The primary, or deepest, causes for disease are three negative emotions or states: Craving, Ignorance and Hatred. These can predispose a person to disease by contributing to humoral imbalance. Secondary causes of humoral imbalance include improper diet or behavior, change of seasons or weather and toxins or poisons. Even injuries or wounds are associated with changes in the Humors. Evil Spirits or demons are also seen as affecting health in a variety of ways. Many illnesses caused by demons must be cured with rituals." Negative thoughts and emotions... An obvious heath issue that has plagued the human race for centuries. If you haven't visited the American Museum of Natural History in a while, or at all, you should know in advance that the Museum has become very, very busy due to the popularity generated by the Night at the Museum movie franchise. I recommend that you get there when it first opens and that you go in through the side entrance. We visited on a Sunday morning and were there when they first opened, entered through the side and went right in. When we came outside a few hours later there were so many people we could barely make our way out of the front of the building. Double lines were down both sides of the block and I have no doubt that people were waiting for hours to get in (if they got in at all). That said, you should still definitely try to go. I saw some similar art works at diagnostic medical sonography schools. Those weren't as comprehensive as this collection, though. I think my dentist Glen Iris wisdom teeth friend would love to see this collection. I'll forward the link if you don't mind. This was such a good show...I'm glad I made a point to go into the city to see it. As I recall there was a book published with it too. Not sure if I bought it or not, if I can find it (in my stacks) I'll post the title. 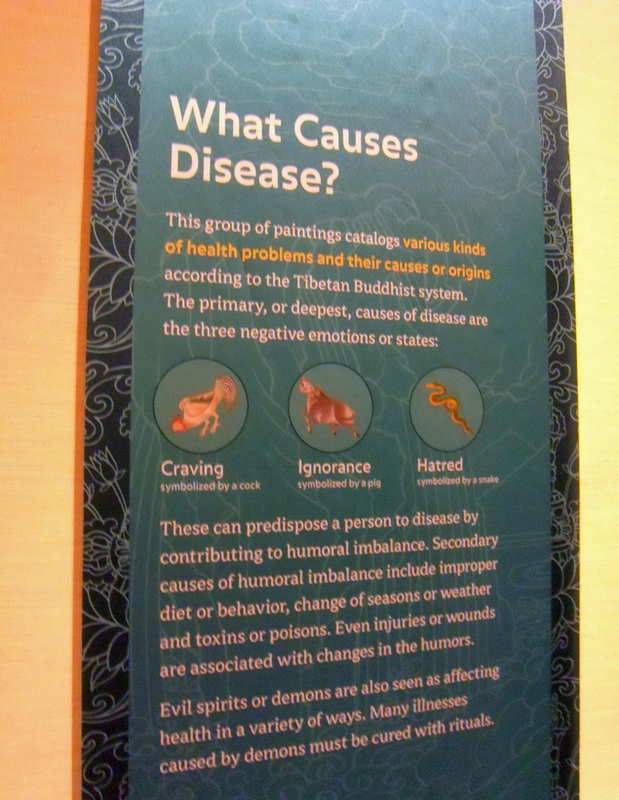 I know there are a set of "healing cards" that were published that replicate the paintings. Feel free to share the link...I also encourage people to follow our blog (on the right, scroll down) either through Networked Blogs or Google. You also might be interested in some of our interviews with Medical Qigong instructor Darren Orr. Look under Well Being and Interviews up above. enjoy your day!